We’d love your help. 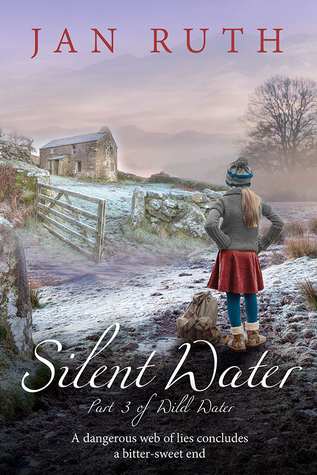 Let us know what’s wrong with this preview of Silent Water by Jan Ruth. The tragedy and comedy that is Jack's life; a dangerous web of lies concludes a bitter-sweet end. Jack Redman, estate agent to the Cheshire set and someone who's broken all the rules. An unlikely hero or a misguided fool? In this sequel to Dark Water, Jack and Anna must face the consequences of their actions. As the police close in and Patsy's manipulative ways hamper the investigations, will Jack escape unscathed? To ask other readers questions about Silent Water, please sign up. This is the third in Jan Ruth’s ‘Wild Water’ series and Jack is back and in more trouble than ever. You do need to have read the first two books to really get the most out of this, but they are such lovely books to read that it's really no hardship! Set mainly in the beautiful Welsh countryside, the author does a fantastic job of making the reader feel that they are there in the mountains. The settings are beautifully drawn and show the love that Jan Ruth obviously has for the places she describe This is the third in Jan Ruth’s ‘Wild Water’ series and Jack is back and in more trouble than ever. You do need to have read the first two books to really get the most out of this, but they are such lovely books to read that it's really no hardship! The characters are realistic, warm (for the most part!) and definitely drawn from real life. Jack and Anna want nothing more than to forget the incident with Simon Banks and to move on with their lives, but as suspicions mount (fuelled by the fabulously portrayed bitter ex-wife Patsy) tensions between them fester and grow. And this time it's serious, as not only is their relationship at stake, but Jack is facing the very real threat of being accused of murder. Added to this are the everyday trials and tribulations of coping with the inevitable problems children (of all ages) bring with them, and the stresses of dealing with an ex-wife who is still pulling all the strings. As with the previous books, Lottie, Jack’s pre-teen daughter, is a joy. Funny, entertaining, outrageous at times, her fragility is evident behind the showing –off, and that mix of emotions is another strength of the writing. This is a perfect book for a quiet day with your feet up – in fact I recommend the whole series. The Wild Water series includes everything I desire for a perfect read. It describes contemporary life in all its complexities; love, passion, family connections, humour and tragedy. After the changes in family circumstances brought about by the blossoming romance between Jack Redman and his childhood sweetheart, Anna, when they reconnect in Wild Water, the plot grew menacing in Dark Water leaving readers on a cliff-hanger. Silent Water delivers everything I had hoped for. Events catch up with Ja The Wild Water series includes everything I desire for a perfect read. It describes contemporary life in all its complexities; love, passion, family connections, humour and tragedy. After the changes in family circumstances brought about by the blossoming romance between Jack Redman and his childhood sweetheart, Anna, when they reconnect in Wild Water, the plot grew menacing in Dark Water leaving readers on a cliff-hanger. Silent Water delivers everything I had hoped for. Events catch up with Jack and Anna and they must decide whether to reveal their secret. Jack Redman can be embarrassing and foolish, but his passion and commitment to those he loves, make him irresistible. Anna is quieter and more thoughtful, she takes longer to decide on her actions. The other main characters are also fascinating. Ex-wife Patsy is miserable in her new life in Chester and her depression leads her to be more manipulative than ever, but does she really deserve our sympathy? Jack’s daughter Lottie is hilarious as she enters puberty, acting outrageously to cope with her need for a stable home. A fitting end to a great saga. All the same thoroughly interesting characters make it through to further complicate Jack and Anna's world, taking up where Dark Water left us. I loved this series because there is so much going on for everyone, and yet I never felt lost. Lottie's one-liners never fail to raise a giggle or an eyebrow, or both! I hope we see more of her as she grows up, in other books... And just when you think there can be no more lies and Jack can rest easy... Well, no! A good tidy ending to the trilogy. I have loved the wild water books and book 3 did not disappoint at all. I couldn't put it down! The real story began at school, with prizes for short stories and poetry. She failed all things math Jan Ruth lives in Snowdonia, a mountainous area of North Wales, UK. Jan writes contemporary fiction about the darker side of the family dynamic, often blending life in rural Wales with a touch of city business. Her style is best described as fast-paced and realistic, with a sprinkling of dry humour.